HighForce®-P are ultra-flat, ready-to-use, iron core linear motor stages with high peak forces und high dynamics. With a max. strength of 4.000 N and a design of only 78 mm height, the drive system belongs to the world's leading linear mototr stages. 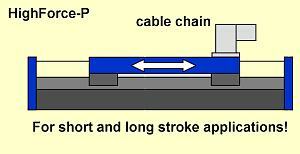 It is the ideal linear stage for applications with large strokes and very short positioning periods. HighForce®-P is consructed with very stable carrier mechanics, two rails, four or six ball carriages, two front plates and an integrated scale. 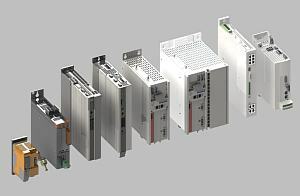 HighForce®-P linear drives are electrically designed according to the OpenLin® concept. Guides designed according to the OpenLin® concept can be used with positioning controllers, regardless of the manufacturer. 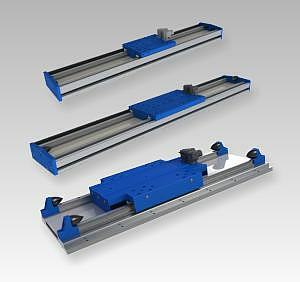 The linear motor elements, as well as the scale are industrial standards and the technical documentation is disclosed.